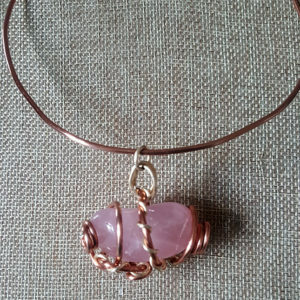 Copper wrapped Rose Quartz pendant and copper cuff choker. 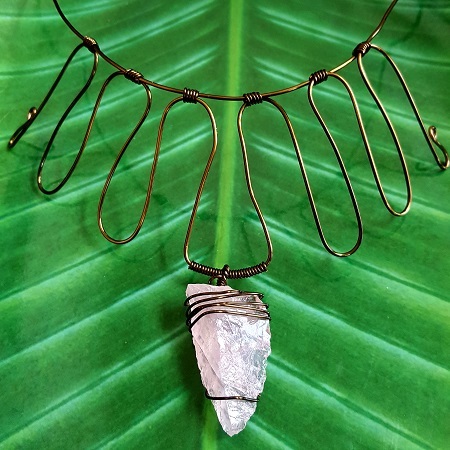 Rose Quartz is such a romantically divine stone that it teaches unconditional love for self and helps you to attract and accept love from others. It is associated with the heart chakra and allows one to open their heart and heal any emotional wounds and release any unhealthy residue. It will aid in clearing out any trust issues, anger, grief, trauma, inability to forgive, and jealousy. Working on the heart chakra can bring about an increase in self love, self worthiness, trust in self, forgiveness, and acceptance. This deep internal healing can result in creating an abundance of inner fulfillment. We provide simple, natural, & sacred products to cleanse & enhance the wellness of body, mind, and soul.